Abstract: Installing a socket LGA2011 Intel Core i5 or i7 processor into a fresh motherboard can be intimidating step, particularly if you've never worked inside a PC before. Well, PCSTATS has heard your calls for a quick Beginners Guide on this subject, so that's what we'll be laying out in this article today! Once you know what not to touch and how to figure out which way the CPU fits in, it's really not all that difficult. Best of all, when it comes time upgrade your processor with a faster chip, you can extend the lifespan of the whole PC and save yourself a few bucks in the process! In this PCSTATS Beginners Guide we'll show you how to install and remove a socket LGA2011 Intel processor, step by step. If you've been considering a computer upgrade, bookmark this Guide for future reference. A few words of warning - Computer processors are sensitive electronic devices. 1) Always make sure the power is off and the computer is unplugged before opening it up. 2) Never touch the gold connector pads on the bottom of the CPU and always be extremely careful when inserting the processor into the CPU socket. 3) Don't touch the delicate gold pins in the socket, they bend easily and may be damaged by the oils from your skin. 4) Always ground yourself to a metal object before doing any work inside a computer system to minimize the risk of an electrostatic discharge. 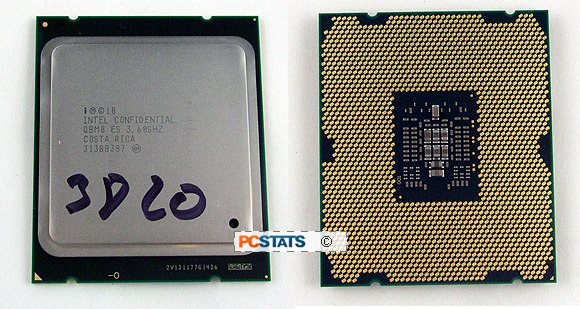 Intel's socket LGA2011 processor is a relatively large chip, but it's built the same way as previous socket 775/1155/1156 CPUs. On the top side of the processor is a silvery metal lid known as the 'Integrated Heat Spreader' (IHS). The IHS has the model number and speed information laser engraved into the surface. In one corner of the green substrate the IHS sits on is a small gold triangle which we'll use to align the processor in the correct direction for installation. On opposite ends of the substrate are two notches which key into the socket. Intel doesn't list the socket number on the actual processor, that information is printed on the box. On the bottom of socket LGA2011 Intel processor are two thousand and eleven gold pads and a small patch of surface mount electrical components. The gold electrical contacts should not be touched, always handle a processor by the edges only. The gold pads on the base of the CPU make contact with corresponding electrical pins in the motherboard processor socket. Remember - It's best practice to leave the processor in its protective chip carrier until you are ready to install it into the socket. On the motherboard you'll find the Land Grid Array 2011-pin processor socket where the CPU goes. The socket consists of essentially three separate parts; a top metal load plate, a pair of metal lever arms and the bottom electrical socket which consists of tiny gold pins that contact the base of the CPU. The LGA2011 socket is shown below with the top metal load plate and protective plastic cover folded open so you can see the gold pins. Motherboards ship with a protective plastic cover over these pins when no processor is present, the pins are extremely fragile and very easily damaged if you are careless. 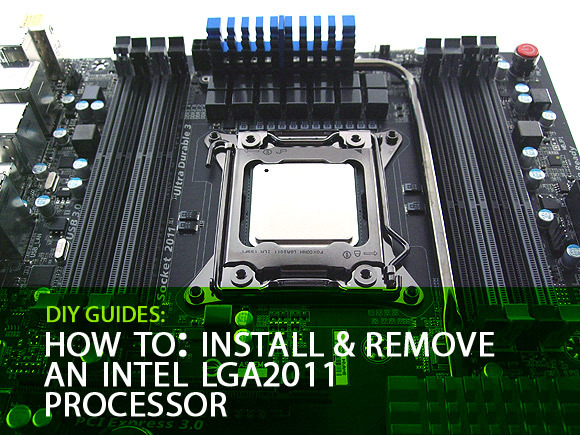 Now that we're familiar with the major aspects of the CPU package and LGA2011 socket, let's run through the process of installing an Intel socket LGA2011 processor. Later in this Guide, PCSTATS will show you how to remove the CPU from the socket in case you want to upgrade motherboards or switch to a faster chip.